He was only 20 years old when he died. His family still mourns his loss. John was born on August 21, 1946. His brother Dennis told me that John worked on his grandparents 1,200 acre farm on Tyendanaga Mohawk Territory, in Ontario Canada. His grandparents were of Mohawk desent. John was 50% Mohawk which entitled him to a band card. This card allowed him to cross the US / Canadian border. In effect this made him a north amerrican citzen. Johnny would hitch hike up to the border from Long Island. His Uncle Ward would then pick him up at the border. Johnny would work the farm until school started in the fall. His mom (Helen), sister Debbie and brother Dennis would then come and pick him up. He did not have to go to Viet-Nam. He could of just crossed the border and gone to live on his grandparents farm. Tyendanaga Mohawk Territory is sovereign land, he could not have been taken away from here. He was a true Mohawk Warrior and wanted to go to Vietnam with his frends. He enlisted in Merrick, NY after having served in the Merchant Marine as a deck hand. He entered active duty in the Marine Corps on January 24, 1966 when he was 19 years old. He did his boot camp training at Parris Island, South Carolina which he completed on March 23, 1966. After boot camp he was transferred to Camp Lejune for additional training and on April 6, 1966 his MOS was changed to 0311 - Rifleman. He was assigned TAD (Temporary Additional Duty) at Camp Pendleton, Californina from June 24, 1966 until August 7, 1966 when he left for Kadena AFB on Okinawa. On July 21, 1966 he signed his Will and Last Testament as well has his Power of Attorney; this was done in anticipation of his service in Vietnam. He departed from El Toro Marine Air Station. 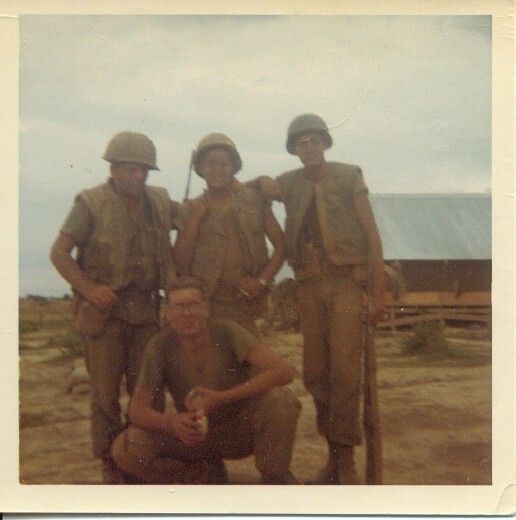 On August 1, 1966 he was promoted to PFC. On August 18, 1966 he left Okinawa on a U.S. government flight to Vietnam. He landed in Da Nang where he joined Company "L", 3rd Battalion, 9th Marines, 3rd Marine Division (REIN) Fleet Marine Force and he served with this unit until his death. On this same day he was awarded the Vietnam Service medal. From August 19th until October 28th he participated in OPERATION MACON against Viet Cong forces in the area around An Hoa. From December 11th until December 15th he participated in OPERATION STERLING in the area just outside of Da Nang. The 6 weeks between OPERATION MACON and OPERATION STERLING were spent in small unit action in and around Da Nang. Four months after landing in Vietnam he left on December 18th via plane for Travis Air Force Base in California for emergency leave. 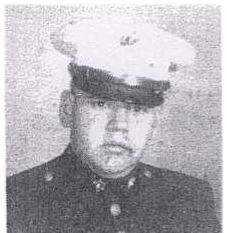 Three weeks later, on January 12, 1967 he left from Travis for Okinawa where he arrived on January 13th. He remained in Okinawa for about 6 weeks. 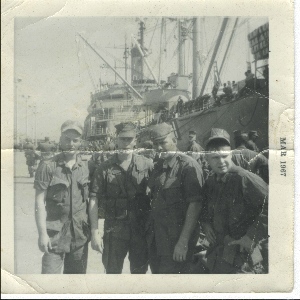 He headed back to Vietnam aboard the USS BAYFIELD (APA-33) which he boarded on February 22nd. On February 24th they departed Okinawa from the Tengan Pier. He arrived in Dong Ha, Vietnam on March 1st. shortly before the USS BAYFIELD left for Vietnam. He no sooner landed in Vietnam than he was back in action. From March 1st until March 18th he participated in OPERATION PRAIRIE II. From March 19th until April 19th he was part of OPERATION PRAIRIE III. On March 30th he was awarded the Vietnam campaign medal. From April 20th until May 18th he took part in OPERATION PRAIRIE IV. From May 18th until his death on May 26th he participated in OPERATION HICKORY. This map shows the area around Dong Ha where LIMA Company was operating at the time John was killed. LIMA Co. left their rear area near Dong Ha and moved up the Cam Lo road towards Con Thien and the DMZ. On the night of May 25th LIMA was mortared and took several casualties. The next morning MIKE Co. assaulted a NVA position (possibly the 324B Divison) about 1 mile from LIMA Co. They then moved back to where LIMA was. The NVA positions were heavily shelled by artillery all night. On Friday, May 26th 1967, LIMA Company assulted the position but met little resistance. The battlefield was covered with bodies, weapons and other items the NVA left behind. The hill was also littered with unexploded shells and 1st Lt. Richard Daerr called the Squad Leaders together to give them instructions to get off the hill. At the same time John was policing the area. He found a different type of mine hanging from or tied to a tree. For whatever reason he picked it up and walked towards the command post. He arrived at 2:05 PM (1405). He said something to the effect of "Look at this". Cpl John Coleman, who was a squad leader at the time, saw it just before it exploded and described it to me as being "the size to two large pie tins put together". LCpl Ron Parsons, who was radioman at the time, was keeping a list of the items recovered and also looked up. He later identified the mine as a Chinese Communist DH-10 type claymore mine. This was a manually activated mine, you had to manually set it off as compared to American claymores which could be set off electrically. This mine was about 1 foot in diameter and about 4 inches thick. Lt Daerr said he remembered John walking towards them "and then darkness and pain". 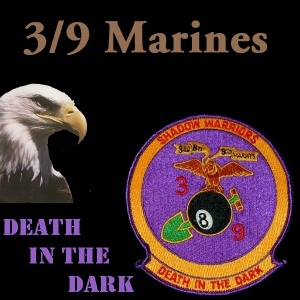 The same mine that killed John also killed or wounded a number of other good Marines. John Coleman, Ron Parsons and Rocky Crumrine were among the wounded. Steve Weber who as an Asst. Gunner was spared because he was in a prone position setting up a perimeter. 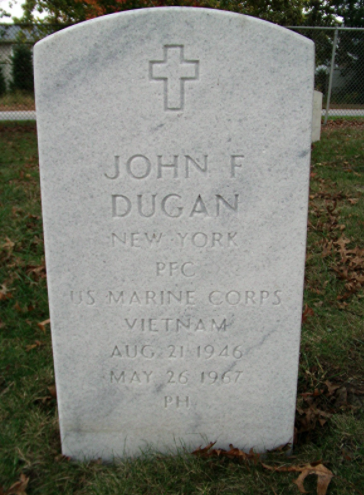 Lt. Daerr said of John "He was an outstanding Marine, [. . .] always looking out for his fellow Marines, as was true of all my Marines". The commanding officer of the 3rd Battalion, Major Samuel Faulk, had this to say about John in a letter he wrote to John's widow Ann. "John's cheerful disposition, uprightness, and devotion to duty won for him the respect of all who knew him." In a different letter sent to John's parents he had this to say "John was one of the finest Marines I had ever known. His exemplary conduct, leadership, and singular determination to do every job well were qualities that all of us respected. We will miss him and hope that you will find some comfort in knowing this." 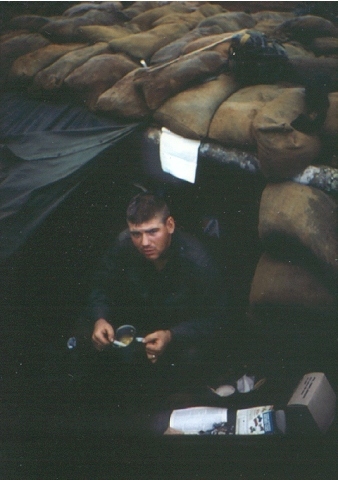 This is a photo of John that was probably taken at Hill 42 near An Hoa sometime in September or October of 1966. He's sitting on top of an ONTOS (a tracked vehicle with six 106 recoiless rifles). 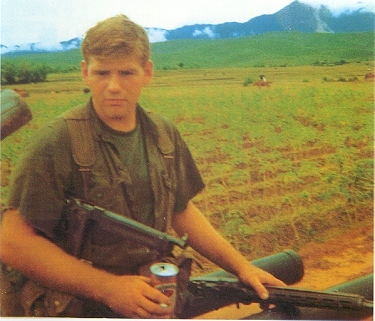 The Thompson submachine gun he's holding probably belongs to the ONTOS crew because they were too heavy to carry in the field and their range was not long enough. The beer was delivered to the field about once a month. This photo was taken on hill 42 near An Hoa. They are looking pretty dusty because they had just come in from convoy duty guarding trucks on Liberty Road. John was given last rites of the Catholic church by Cmd J. P. Ryan, USN. His body was processed at Company "D", Third Medical Battalion located at the mortuary at the Ton Son Nhut airbase in Saigon. His body was flown home and a wake was held at the Walker Funeral home in Merrick, Long Island, New York. 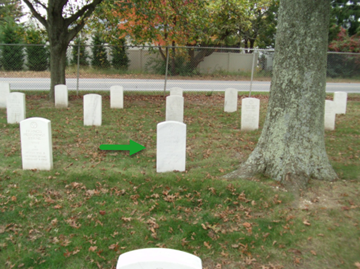 John was laid to rest at the Long Island National Cemetery in East Farmingdale (Long Island), NY. His name is the first one on the line. If you get a chance to visit, please do. Details about John's military service were provided by the US Marine Corps through the Freedom Of Information Act. Their help is acknowledged and appreciated.